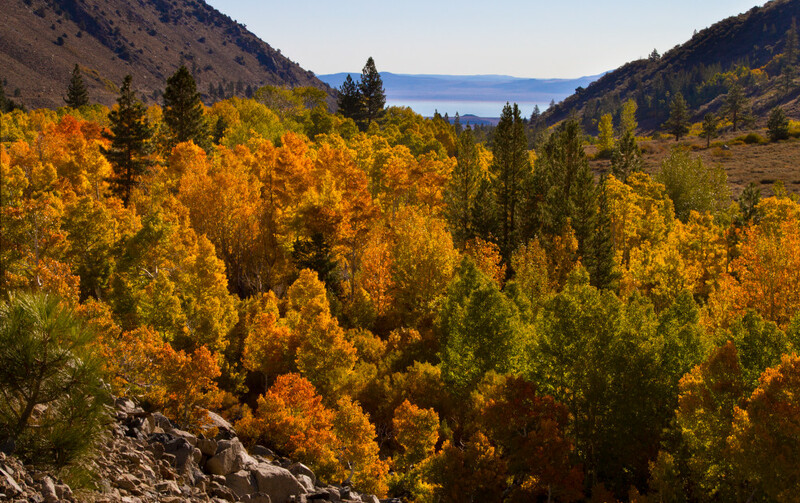 Vibrant fall colors dominate the foreground, complemented by the blue of Mono Lake in the distance. The Tioga Pass in the Eastern Sierra Nevada mountains leads from Yosemite National Park to the town of Lee Vining, near Mammoth Lakes. The road is usually closed in winter due to ice and snow, but in autumn it's a beautiful drive. And if you're lucky enough to be there just at the right time, you'll see groves of aspens "blazing" in yellows and oranges with Mono Lake providing a complementary blue backdrop.